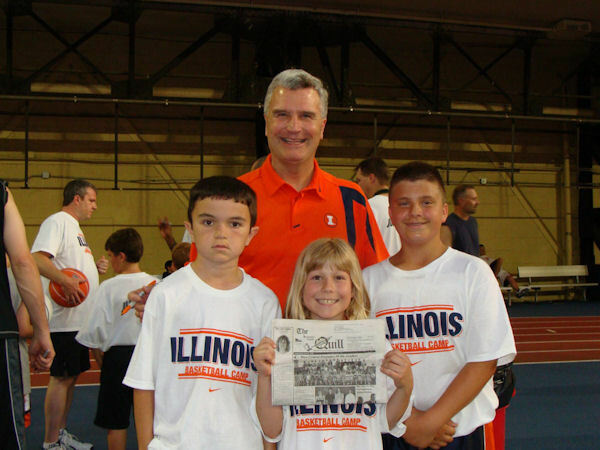 Dylan Klossing, son of Boyd and Sue Klossing (Burlington, IA) and Dani Bredar, son of Mike and Vicki Bredar (Burlington, IA), grandchildren of Barb Klossing (Stronghurst) and Trever Phillips, son of Rod Phillips (Stronghurst) with Illini Coach Bruce Weber, took The Quill along to the University of Illinois parent child basketball camp this past summer. The kids and their dads have attended the camp for the past three years. Later, Mike, Dani, Boyd and Dylan attended the last Illinois-Iowa basketball game in Iowa City and Mike, being the only Iowa fan in the group was the only unhappy fan at the game.